The rhythms of Abakuá music are generally played similarly in Havana and Matanzas, but there are three styles: that of “Nyánkue” (funerary rites), and those of the Efó and Efí lineages. The music of “Nyánkué” is traditionally played with loosened skins on the drums, while the drummers hold the drumheads downwards. 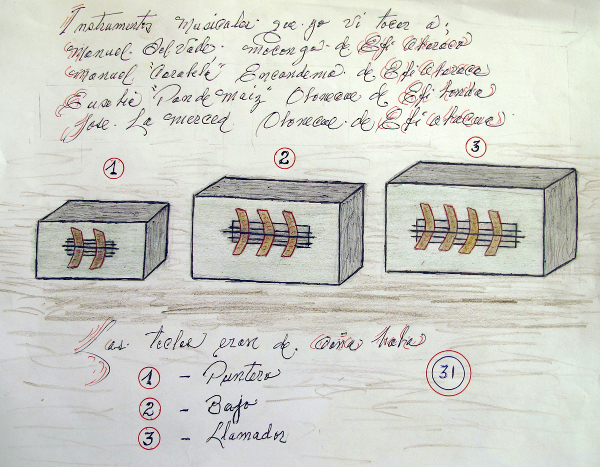 (Such techniques are also used in funerary rites among communities with Ékpè in Africa). Ékpè funeral procession, Ikom urban, Cross River State, Nigeria, 2010. The drums held with skins downwards. 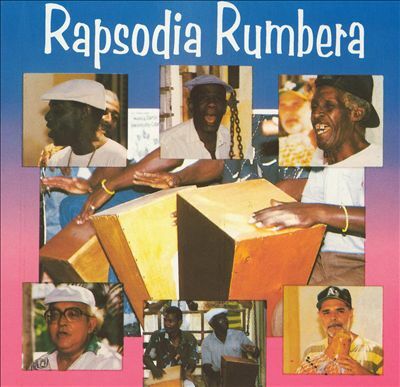 The Cuban “Nyánkue” rhythms are played at a very slow pace meant to express sadness for the loss of a member. 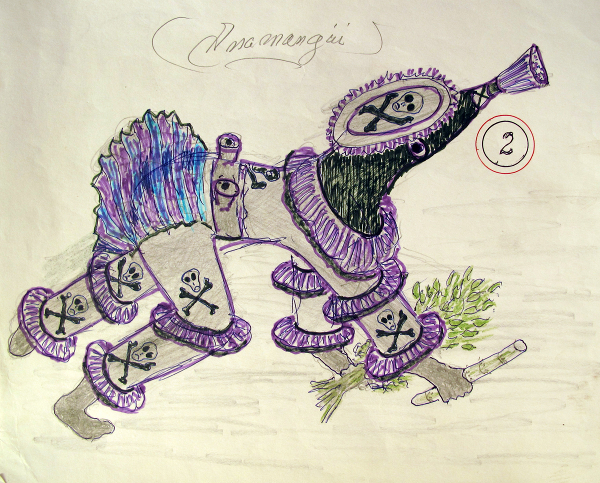 Instead of using an iron ekón ‘bell’, a wooden bell is used to mark time, and the Íreme Anamanguí (the funerary body-mask) wears wooden bells around its waist (instead of the metal bells of other Íremes). "Abakuá" (extract) from Rapsodia Rumbera vol. 2 (EGREM). In the initiation ceremonies, the music of Efó lineages is slower (yet not as slow as that of “Nyánkue”), while that of Efí lineages is faster. The Abakuá mythic-histories - called tratados ‘treaties’ by Abakuá members - tell that when the Efó delivered the mystic Voice to the Efí, they also exchanged musical instruments and cloth that was used to refashion the body-masks in new ways. The Efó gave the Efí the Voice, and also their musical instrument called ‘marímbula’. This is a ‘lamellophone’, commonly made as a box with keys (1). This instrument is no longer played in Abakuá practice, but in memory of this ancient event, most Abakuá lodges keep a symbolic ‘marímbula’ on their altar. 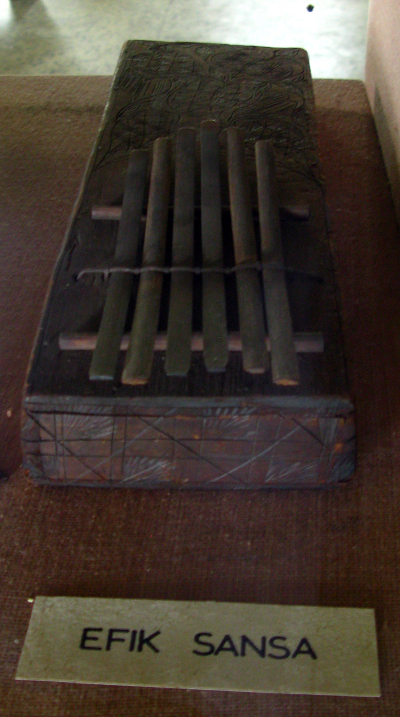 Cabrera (1988: 92) wrote: “Ayeremímbo amunyontuí bekomekue ndeme Efor: The marímbula was the first Abakuá musical instrument. 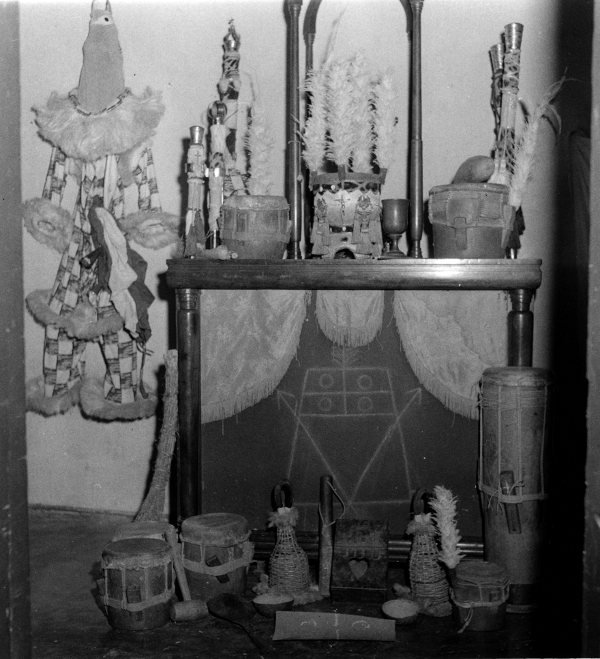 Abakuá instruments, including a five-keyed ‘marímbula’, on a temple altar. This ‘treaty’ was memorialized in Matanzas in 1903 with the foundation of a lodge called Efí Kondó Íreme. An Abakuá member of the Uriabón Efí lodge of Havana, recalls his elders playing ‘marímbulas’ in the 1940s. The presence of the ‘marímbula’, of the drum ensemble, and of the flashy masquerades, are explained in terms of historical exchanges in Africa between the Efó and the Efí. Cross River Ékpè representatives understand such exchanges as standard elements in the development of their own system. “Efik Sansa” a lamellophone with decorative designs carved on the box surface. National Museum, Oron, Akwa Ibom State, Nigeria, 2011. “Ubo.-aka (thumb piano)... was at one time, and is still in some areas of Igbo land, a ritual instrument; it was, in other words, functional within the social and cultural context of the Igbos” (Lo-Bamijoko 1987: 28). In Ibibioland, “èkpà... a kind of thumb piano made of wood of calabash with metal keys; a play in which the thumb piano is used” (Urua et al. 2004: 44). The percussion instruments of Cuban Abakuá are patterned from those of the Cross River region of Africa. 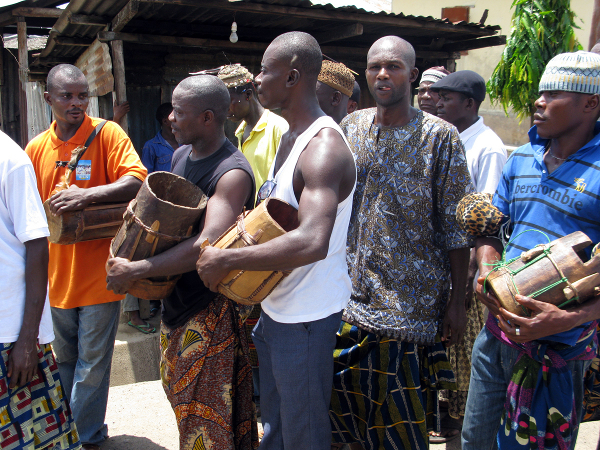 In Calabar, the instruments used in Ékpè ceremonies are known as: nkong ‘metal gong’, nsak ‘basket rattles’, and three drums, generally called èkömö. Specifically they are known as ubörö èkömö ‘answer’ drum, eyen èkömö ‘child drum’, ibit ‘long talking drum’. (Okpo 2013 pers. com.). These instruments have variations throughout the region into Cameroon. Drums tightened with pegs in Igbo-speaking regions (Meyer 1997: 161). 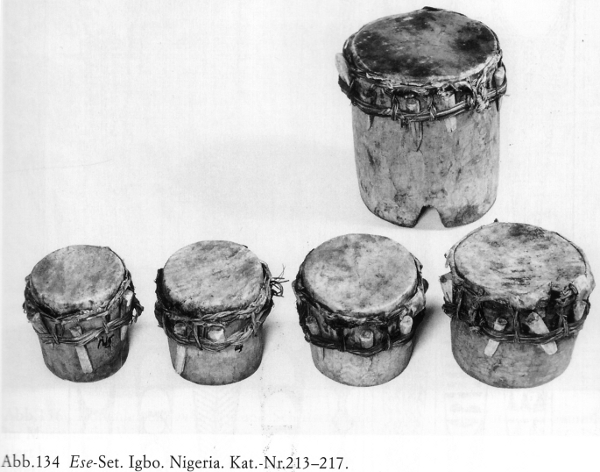 Compare to Abakuá drums (first photo of this chapter). In Abakuá, the nkong ‘metal gong’ is known as ‘ekón’; the ‘basket rattles’ are known as ‘erikúnde’, and the drums - èkömö - are generally called nkómo and three in number. These will be discussed in the next section. In the Caribbean countries of Panama and Colombia, African-descended communities use sets of drums tightened with pegs that indicate their sources in the Cross River region; these have influenced the national popular culture. 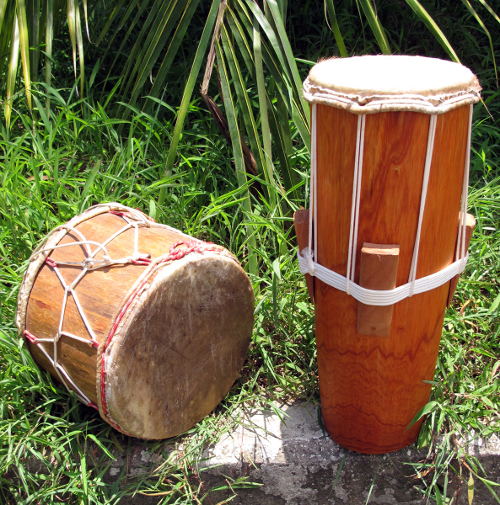 The long ‘tamborcito Carabalí resembles the Abakuá nkómo called Bonkó, the ‘talking drum’. ‘Tamborcitos Carabalí’, Panama City, 2012. Archives of Dr. Marcos Ostrander. While the percussion styles of Abakuá music have a great deal of influence from Africa, the melodic vocal styles generally have been influenced by Spanish song styles, as well as the Latin masses of the pre-1962 Catholic church. These observations have been deduced from comparative studies with music of the Calabar region. For example, Ékpè songs in Africa are often short statements that are repeated by a chorus, while Abakuá lead chanters recite lengthy phrases recounting their African history in sessions that can continue for hours during ceremonial gatherings. (1) Cf. Cabrera (1954: 403); Cabrera (1975: 387); Ortiz (1955 vol. 5: 100). Abakuá leader Gómez (2003) wrote: “In Efor there was no music like we play today; they played the marímbula.” “En la fundación de la Potencia Efike Butón se trasmitió la Voz de Ekue con marímbula, instrumento que ‘pertenecía a los Efik” (Cabrera 1988: 146). This type of instrument has variant styles and names across sub-Saharan Africa. Kubik (2001: 171) coined the umbrella term lamellophone, since its “sound is generated essentially by the vibration of thin lamellae or tongues of metal, wood or other material.” See also Kubik (1964, 2001). (2) (Crow 1830: 277). See also Talbot (1926/ 1969: 812-13, vol. 3).